The Boston Celtics are reportedly signing Jonathon Gibson to a rest-of-year contract after losing Kyrie Irving until next season, per Yahoo's Shams Charania. 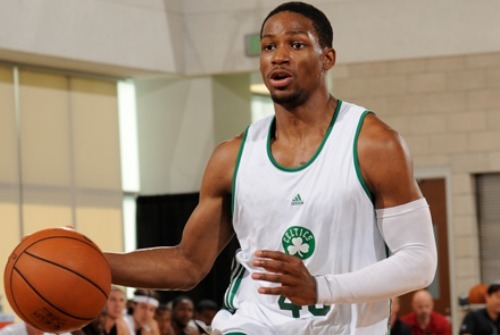 Sources: The Boston Celtics are signing guard Jonathan Gibson for the remainder of the season. Gibson averaged 33.7 points in China this season. Gibson will be available shore up the Cs' devastated roster depth in the wake of Irving's absence. Jonathon, who has been playing overseas in the Chinese Basketball Association, averaged 33.7 points (fourth overall in the league) and 4.6 assists per game for the Qindao Double Star Eagles this season. The 6'2, 30 year-old product of New Mexico State played 17 games for the Dallas Mavericks last season, where he averaged 6.2 points and 1.5 assists per 13.6 minutes per game with the club. He was also a member of the Celtics' 2012-13 NBA Summer League team, and will provide desperately needed depth behind starting point god Terry Rozier, who will lead us to the promised land, or, failing that, hopefully the second round. CORRECTION: Gibson will not be playoff eligible unless a player is cut, as he was signed with the hardship exception generated by several concurrent Boston injuries. In theory, he could earn a spot and force the Celtics to cut a player, presumably Abdel Nader. That scenario seems unlikely, but remains a possibility.